Still, here’s a tip to help you fake that full lipped look with makeup instead of using collagen injections which are painful and can go horribly wrong as numerous celebs have shown us. Apply a layer of lip balm on your bare lips. Using a lip brush, apply lipstick only on the outer edges of your lips by the sides – the 4 outer corners of your lips and blend. 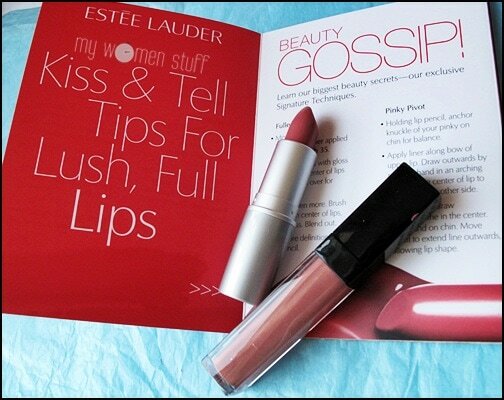 This was a tip shared by Joyce the senior makeup artist at Estee Lauder at the Estee Lauder Beauty Gossip event which is currently ongoing at MidValley Megamall. Did it work? Do I look like I’m puckering up my lips? 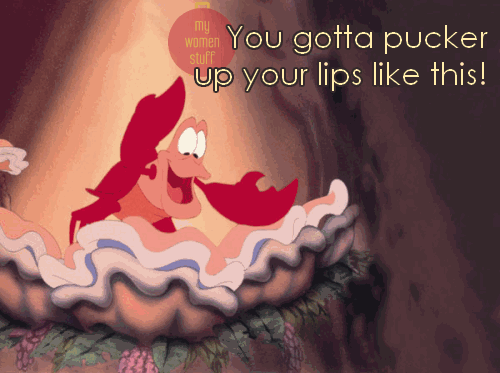 Speaking of which “pucker up your lips” always makes me think of one of my favourite Disney characters – Sebastian from The Little Mermaid. I love Sebastian! He’s got the sexiest lips in cartoon! 🙂 hahahha I can’t wait to read more of your tips! I don’t think I’d like to have Angelina’s lips. *lol* I know a few guys who think they look pretty ‘ugh’ 😀 Sebastian is always one of my most favourite Disney cartoon characters. thanks for the tips, would try it once of this day myself.. hehe.. Anyway, I have a question for you: “How do you know if a toner works for you?” I was just examining my face this morning (after nearly 4 months of not doing so) and I notice that it’s getting a bit dry. I’ve used Clarins (feels like plain water), Artistry (a bit tingly but OK), Clinique (too drying) and now Lancome Rehydrating, which seems OK too. But I’ve been moving from a really dry China to humid Malaysia and am just now getting my pre-natal hormones under control. Hey Kitty! You know what? I don’t believe in “toners”. I shared my views previously on whether toners are necessary and at that time I did not use any. I still don’t use toners in the “toning” sense but I use it to add moisture in the Japanese/Asian skincare sense. So for now, I’m only using the Hada Labo Super Hyaluronic Acid Moisturizing lotion which works great at keeping my skin supple. You could give that a shot to get some moisture back into your skin 🙂 I’m already halfway through mine as its the only one I’m using. I agree with you too about the “toning” sense which is why I went for Lancome. I’ve just got back with some Clinique cleanser, sunblock (I’ve got freckles!) and #2 Clarifying Lotion.